The season’s first prohibition of the use of fireplaces and un-certified wood stoves has been declared by the Puget Sound Clean Air Agency due to chronic air pollution and stagnant weather conditions. State officials claim that 140 people die every year in Pierce County due to chronic exposure to wood smoke, and state-wide nearly $200 million is spent by governmental health plans on hospitalizations and doctor visits brought on by wood smoke. Nevertheless, the newly elected State Senator Randi Becker (R-Eatonville) and Pierce County Councilmember Jim McCune (R- 3rd District) either refute these statistics or discount the severity of the problem. Further, certain kinds of industrial development in Pierce County are currently suspended due to a construction moratorium imposed by the federal EPA due to “non-attainment” of clean air standards in Pierce County, one of only 32 nationwide to be so designated. Clean air officials state that Pierce County has over 23,000 wood stoves that are un-certified, which are generally units designed and built prior to 1995 and lacking modern technological improvements that improve the burn of the fire and reduce pollution, particularly the very dangerous but invisible 4-micron “particulate” matter common to wood smoke. State officials estimate that 20% of the air pollution in Pierce County is derived from wood smoke, with about two-thirds of that emanating from wood stoves and one-third from wood debris burning, especially in south county. About half the air pollution in the county comes from vehicle exhaust, and 80% of all carcinogens in our air pollution come directly from diesel engines. In an effort to improve air quality, outdoor debris burning is outlawed at all times in most areas of the county, and is only authorized at certain times south of 224th St. Under the current burn ban all outdoor burning is outlawed, including recreation fires, and is subject to a $1,000 fine. Dispensing those fines are a beefed-up team of inspectors from the Puget Sound Clean Air Agency and selected members of local fire departments. The Graham Fire Department has told the Mountain News that they have to designate a fire-fighter to full-time duty during the winter months to act as a “smoke cop” and patrol their district – either suppressing illegal fires and/or educating the citizens to the current health crisis. Also combating this problem is the state EPA, which has received a $1.5 million grant to buy-back un-certified wood stoves from county residents. Details can be found at the Puget Sound Clean Air Agency or the Tacoma-Pierce County Health Department web sites. SUNDAY, NOVEMBER 25, 2012, SEATTLE, WA – Due to stagnant weather conditions and rising air pollution, the Puget Sound Clean Air Agency is issuing a Stage 1 burn ban for Pierce County, effective at 1:00 p.m. This ban is in effect until further notice. A high pressure system is expected to bring mostly calm conditions Sunday through Tuesday. We’ll see especially low winds in Pierce County which means fog and a buildup of air pollution. A system should arrive late Tuesday, or early Wednesday to ventilate the region again. Burn ban enforcement has significantly increased in the Tacoma-Pierce County Smoke Reduction Zone. Wood burning during a ban may result in a fine, with fines in the past reaching $1,000. Increased enforcement and night patrols will increase the likelihood of violators receiving substantial fines this season. No burning is allowed in fireplaces or uncertified wood stoves. Residents should rely instead on their home’s other, cleaner source of heat (such as their furnace or electric baseboard heaters) for a few days until air quality improves, the public health risk diminishes and the ban is cancelled. The only exception is if a wood stove is a home’s only adequate source of heat. The Puget Sound Clean Air Agency is an air quality management agency serving King, Kitsap, Pierce and Snohomish counties. Created as a result of the 1967 Washington Clean Air Act, the agency protects public health by adopting and enforcing air quality regulations, educating individuals and businesses about clean-air choices and sponsoring voluntary initiatives to improve air quality. We have numerous ways to stay informed about air quality which can be reviewed at www.pscleanair.org/signup . Included there is social media, e-mail alerts, RPIN, EnviroFlash, and more. Our website itself is a great place to start www.pscleanair.org, it is the first piece of information to be updated with burn ban status. In the upper right corner is our Air Action box with the current burn ban status. We also place a hard-to-miss scrolling burn ban marquee across the top of our home page with a link to the full story/release. We’ve also recently added a new service for Pierce County residents who would like to receive burn ban notifications via text message. They just text PIERCEBURN to 313131 and we will text them with burn ban notifications. Our burn ban information is also replicated on our special program website that has been specifically tailored to address air quality issues in the Tacoma-Pierce County Smoke Reduction Zone. It is located at www.airsafepiercecounty.org . You may have seen the billboards around Pierce County with this info referencing Air. On the safe side. …along with the texting signup info. In addition to that, your readers can phone in to our Air Quality Info Line at (800) 595-4341 where current burn ban status and any restrictions are recorded; as conditions change. Lastly is the news media. We distribute our message to all major news media outlets around the Puget Sound whenever we call a burn ban: radio, TV, print, blogs, etc. Whether they choose to feature our news in their respective news lineups is up to them. 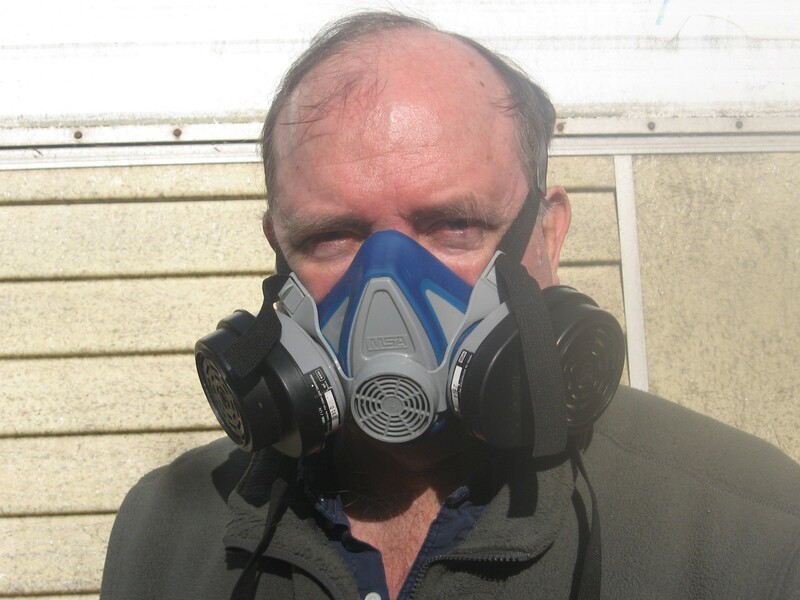 The author at his home in Eatonville during the huge debris smoke crisis of last January that followed the great winter storm. The added info links don’t work. How are we supposed to know when there is a burn ban? I’m working on getting it fixed. Thanks for the heads-up, Kat. Good question. I don’t have a ready answer, but I have asked the PSCAA for their view on how to better inform the public. Sorry for the inconvenience and thanks for the interest and coverage of air quality. Here is a comprehensive view on how to stay abreast of burn bans. We have numerous ways to stay informed about air quality which can be reviewed at http://www.pscleanair.org/signup . Included there is social media, e-mail alerts, RPIN, EnviroFlash, and more. Our website itself is a great place to start http://www.pscleanair.org, it is the first piece of information to be updated with burn ban status. In the upper right corner is our Air Action box with the current burn ban status. We also place a hard-to-miss scrolling burn ban marquee across the top of our home page with a link to the full story/release. We’ve also recently added a new service for Pierce County residents who would like to receive burn ban notifications via text message. They just text PIERCEBURN to 313131 and we will text them with burn ban notifications. Our burn ban information is also replicated on our special program website that has been specifically tailored to address air quality issues in the Tacoma-Pierce County Smoke Reduction Zone. It is located at http://www.airsafepiercecounty.org . You may have seen the billboards around Pierce County with this info referencing Air. On the safe side. …along with the texting signup info. In addition to that, your readers can phone in to our Air Quality Info Line at (800) 595-4341 where current burn ban status and any restrictions are recorded; as conditions change. Lastly is (you) the news media. We distribute our message to all major news media outlets around the Puget Sound whenever we call a burn ban: radio, TV, print, blogs, etc. Whether they choose to feature our news in their respective news lineups is up to them (as you know). Hope that helps. And again, thanks for helping to spread the news about what folks can do to help keep air pollution levels down. Great article on the burn ban in Pierce County. The link To the Puget Sound Clean Air Agency was helpful. A lot of good information there. Everything seems to be copacetic, now. Thanks to all who helped.